At Kadic, Yumi brings an ancient samurai armour for a report. No sooner than she turns her back does XANA take control of it, fumes sliding from an outlet. Jeremy and the others are stupefied and amazed! 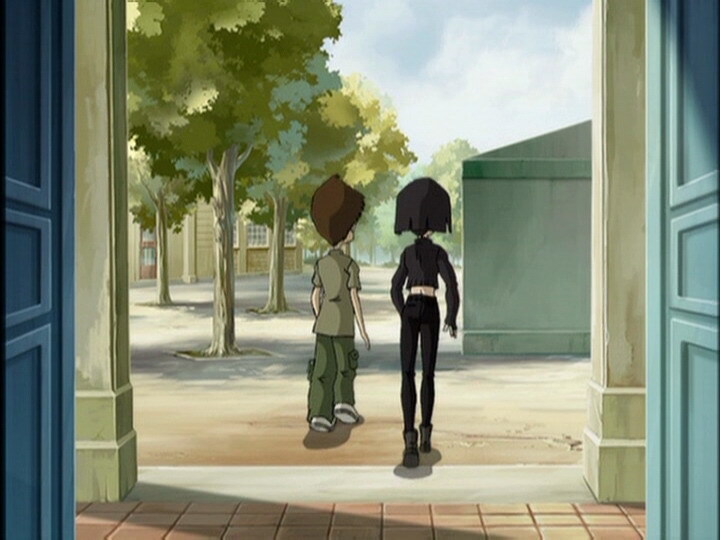 They’re half sure the girl in question is Aelita, though she doesn’t seem to recognise them… Jeremy suggests that she could have amnesia from the materialisation… Odd approaches her rather clumsily, citing specific terms relating to Lyoko, but the young girl becomes upset and storms off. The crazed armour begins to attack, and the heroes, hearing rumours of a man in armour, realise that XANA has woken up… Yumi is taken in by the police. 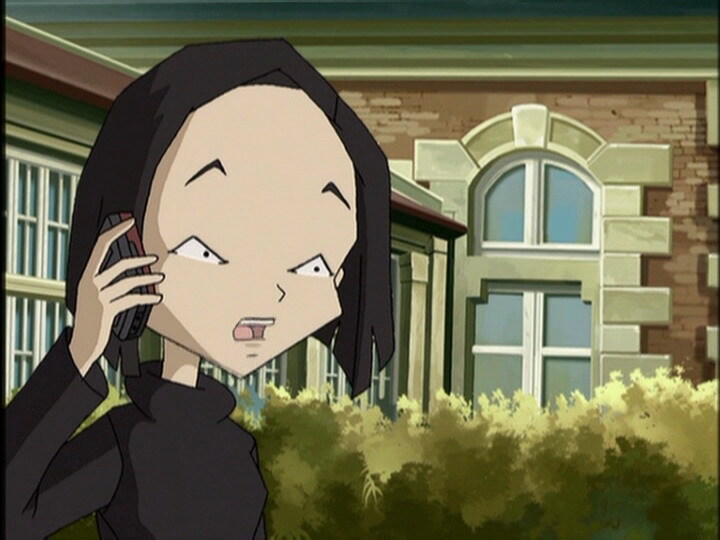 Completely uncontrollable, Jeremy rushes to Taelia’s room and gets her to follow him to the factory, telling her that she probably has amnesia and talks about Lyoko. Taelia is unconvinced, taking Jeremy to be a madman. Fortunately, the armour bursts into the room and tries to decapitate the two kids. It misses and Jeremy takes the opportunity to bring a shocked Taelia to the factory, joined by Odd and Ulrich. 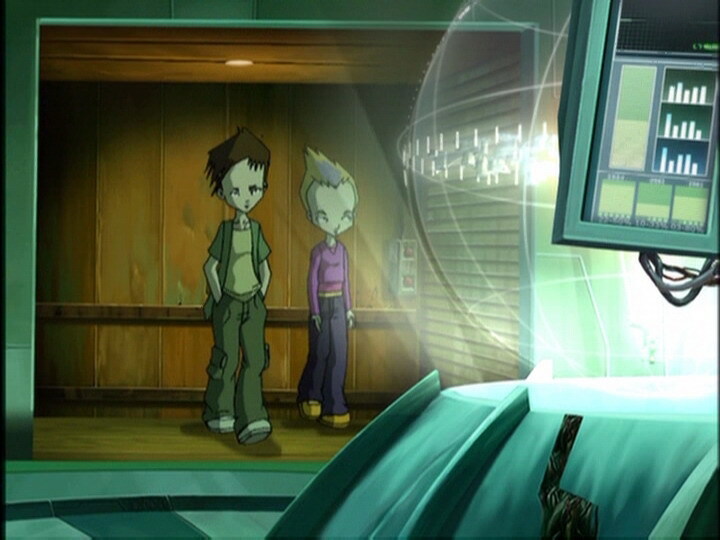 Once there, the two boys decide to go to Lyoko to check if Aelita really isn’t there, in which case, they can turn the Supercomputer off. Taelia spectates, impassive but thinking them all mad… She suddenly leaves Jeremy’s company, returns to the school and warns the authorities. Yumi warns Jeremy about the girl, but is attacked by the armour in the boiler room. She fights back with an iron bar. The two boys defeat the monsters and Aelita runs to the Tower. 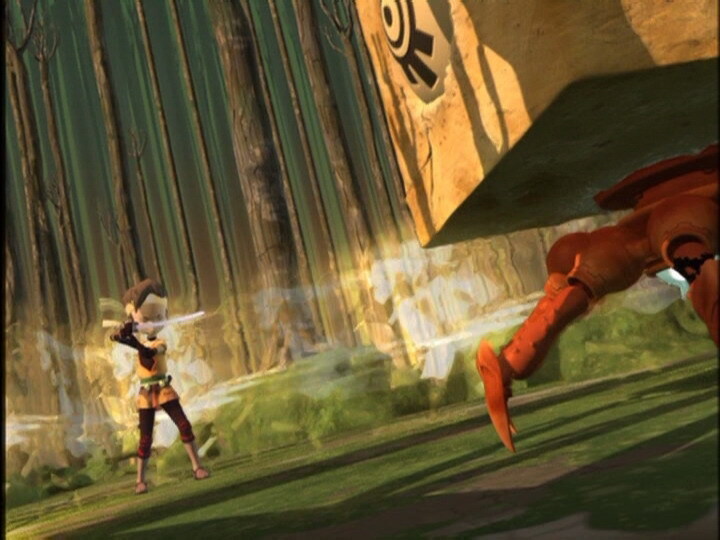 She saves Yumi, one slash away from the world of the dead, by entering the Code Lyoko. Jeremy, who is being carried away by the police, manages to launch the Return to the Past. 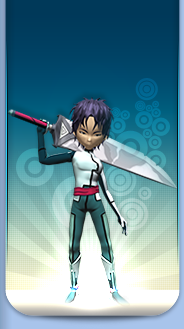 - Attack: Imprison Aelita in a Guardian and take control of samurai armour. 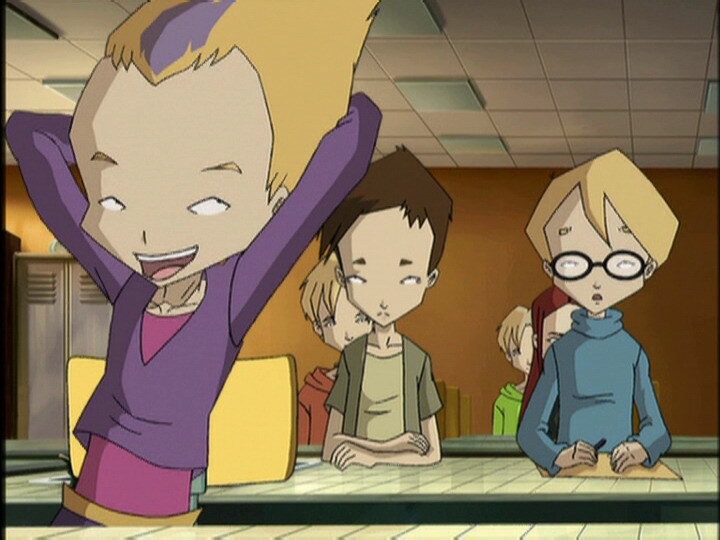 - We (finally) learn that Aelita’s life points regenerate on Lyoko, especially when she’s in a tower. - First appearance of Ms Meyer. - Only appearance of Taelia. - Discovery of the Mountain Sector. - Discovery of Ulrich’s Triangulate technique. - Discovery of the access code to the lift. - First allusion (aside from family name) to Yumi’s Japanese origins with the armour belonging to her ancestors. - Second episode in season 1 in which Sissi is absent. - Milly and Tamiya are in class 6B. - Bloks are Odd’s favourite monster. - According to Odd, Jeremy has never been able to talk to girls. - The principal says that Jim is a man loved by all students. - The factory computer microphone constantly changes (wired or wireless), and in one shot when Jeremy’s trying to figure out how to destroy the Guardian the piece he speaks into is missing. - When Odd watches the two Bloks, the Way Tower’s halo disappears. - When Odd and Ulrich leave the lift, the buttons are in the wrong place. - Just before Odd enters the scanner, the colours of his pants are inversed, as well as when Yumi says “Thanks for caring, guys…”. They become entirely the one shade of purple when she asks Jeremy to hurry. - When Taelia and Jeremy are at the factory the access to the lift is orange. - When Yumi does her report it’s not her class that we see but students in years 7 and 8. 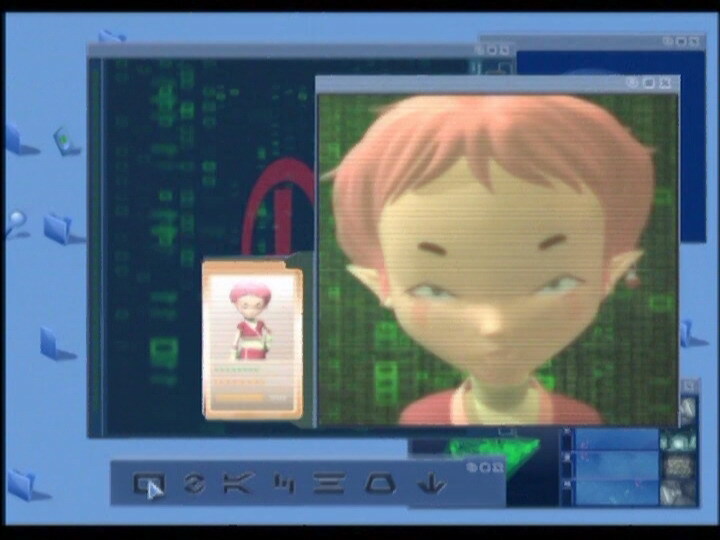 - The buttons on Jeremy’s computer mouse are absent when he tries to localise Aelita. 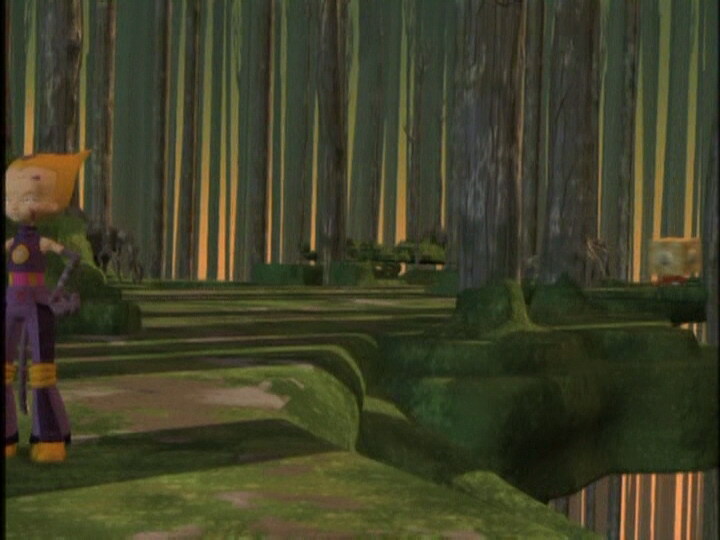 - The platform of the Way Tower lit up when Aelita, Odd and Ulrich landed on it, but was then dark again. - The door of Jeremy’s room is dark green instead of grey and it opens from left to right instead of the other way around. - When Tamiya drops the camera and films Milly’s feet, we see a wired microphone even though she isn’t using one. 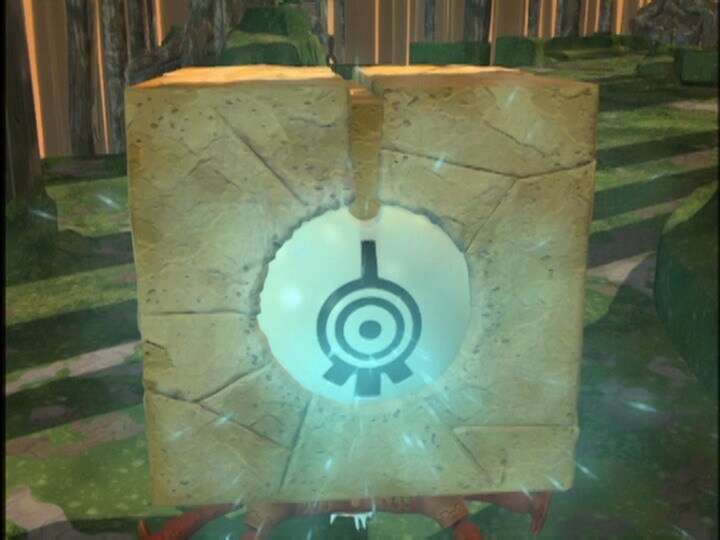 - On Jeremy’s screen, we can see the yellow icon belonging to Aelita before she was freed from the Guardian, which is impossible. - At the moment when the principal enters the classroom, Tania Granjean is behind Odd when she was meant to be sitting behind Jeremy and Ulrich. - Just before Ulrich asks Jeremy to stop, the microphone is in his right ear instead of his left. - Just before Taelia turns to see the samurai armour we see her in the dorms when she’s not actually there at the time. - At the start of Ms Meyer’s class, when she begins to write an equation on the board, it’s not her hand we see but Ms Hertz’! - The principal’s moustache and eyebrows are grey in two shots, when he announces to the students that the armour is nowhere to be found, and those that know anything should go to the police. - The door to the boiler room is grey when Taelia and Jeremy go through it and at the moment when the armour enters, the door changes. When Yumi runs to get out of the gym there’s a grey poster on the door which appears on one of the two doors she uses to enter. - Milly says that she and Tamiya are in year 7, which would place them as being one year behind Jeremy, Ulrich and Odd. They are actually in year 6, two years behind the aforementioned boys. - During Ms Hertz’ class just behind Ulrich we can see Tristan Brossard (even though he’s in year 7) and behind him, his clone wearing a different-coloured jumper. If you look hard at the back row, there’s a definite resemblance between the double and Trasian! - Only appearance of Talia, a young girl who resembles Aelita to a tee. At first (in the French version), the girl’s name was going to be Taelia, an anagram of Aelita, but the name was changed to keep the pronunciation correct! In the American English version, the name was kept in its original form (Taelia). - Final appearance of the Guardian. - First appearance of the Ishiyama’s samurai armour which is seen again in episode 39, “A Bad Turn”. - First time we see Jeremy input the code in the lift to access the lab in the factory. Said code is 5793. - Third time Odd has a Future Flash. 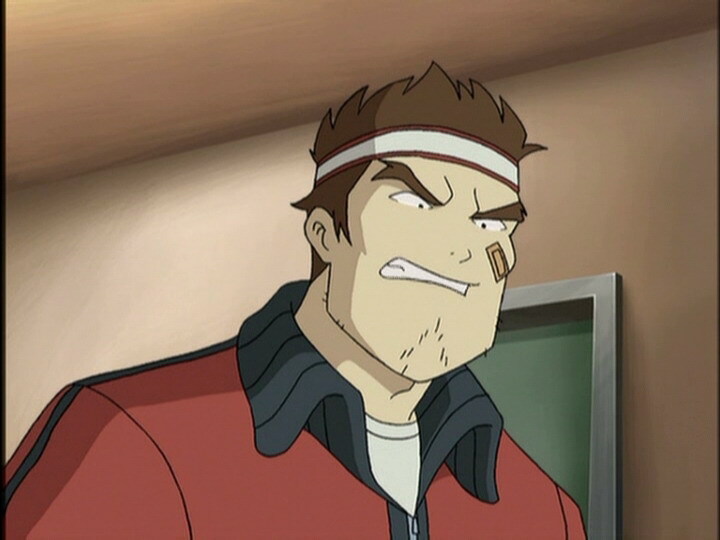 - Ulrich : "A Guardian, the same monster that imprisoned Yumi." 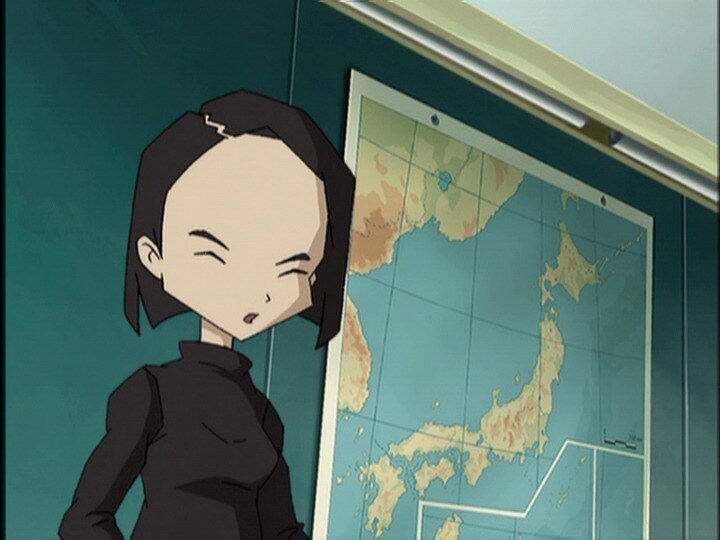 Ulrich alludes to episode 7, “Image Problem” where XANA kept Yumi on Lyoko to send an evil clone of her to Earth to destroy the scanners. - The armour Yumi presents in her report is samurai armour. Samurai were a type of warrior during the feudal period in Japan. 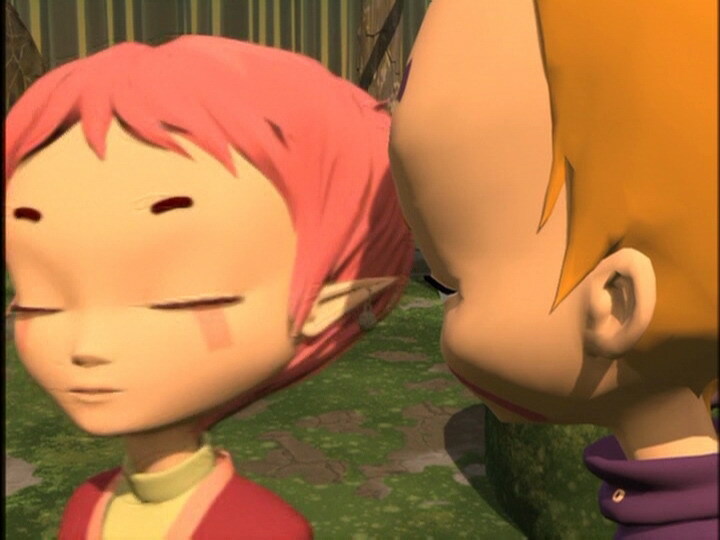 Aelita: Jeremy, do you think we’d get along well in the real world? I mean as well as we do now? Jeremy: Yeah, of course, why? 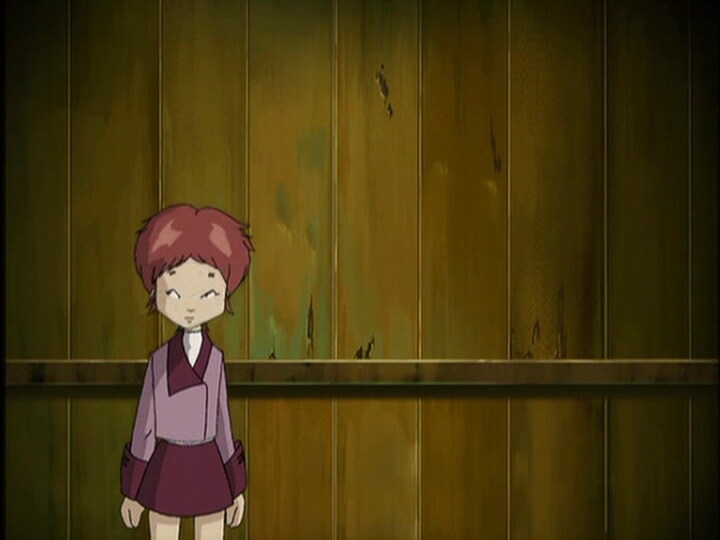 Aelita: Well because I’m not so sure…I’d like to have a best friend who’s useless…you understand? Jeremy (comforted): Ha ha, very funny! Yumi: It’s not a ‘whatever,’ it’s been in my family for hundreds of years! Ulrich: So when are you going to unveil your thingamabob? Ulrich: Well you sure wouldn’t find a thing like that at my house! First of all, your whatchamacallit doesn’t go with the drapes in the living room! Yumi: Whatchamacallit? Whatever? What I like most about you Ulrich is your rich vocabulary! Milly: Fellow middle school students, hello, this is Milly and Tamiya of the 7th grade reporting the school news. You may not know it, but just behind your backs, something strange is hatching! And this, my friends, is a part of it. In our constant quest to report the latest news, we are bringing you this exclusive exposé of what’s hidden under this drape! Tamiya, listen! Is there any reason for your filming your feet? Ulrich: You know, Jeremy, most people use the night hours to sleep. Odd: And what are you going to say to her when you do succeed? You never knew how to talk to a girl! 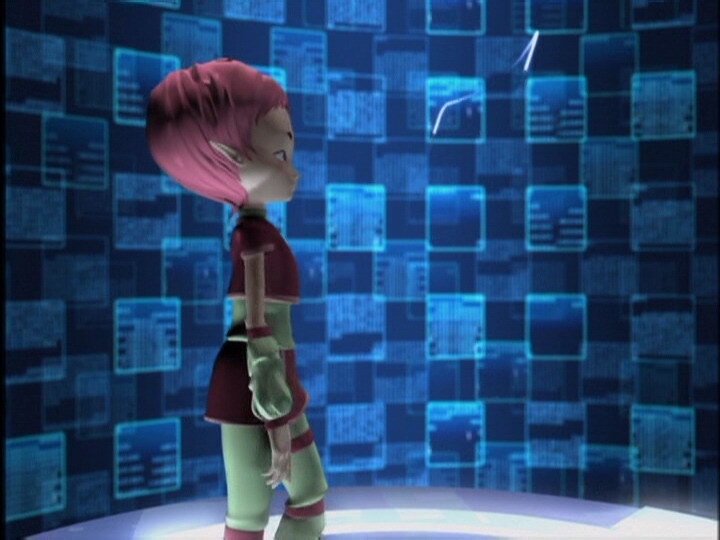 Jeremy: With Aelita it’s not the same! Odd: You’re right, it’s not the same. Odd: Ok, here’s your chance! Imagine she’s right here in front of you in flesh and blood, what are you going to say? Jeremy (seeing Taelia): Ohh, wow! Ohhh! Odd: Beep! Sorry, your time is up! You could do with a few pointers with flirting! (he sees Taelia) Oh wow, this is…I don’t believe it! Odd: Well talk to her, it’s the only way to find out! Jeremy: But what if it’s not her? Odd: Go on! Ok, watch an expert at work, and learn! Jeremy (being dragged over): Hey! Wh-what…wait! Odd: Huh? Hey, who said I wanted to pick you up? I was just making conversation! …uh, by the way, do things like the virtual world, or Krabes, or buzzing monsters mean anything to you? Ulrich: He’s only saying that because he just got the brush-off big time! “Watch an expert and learn” huh? Yumi: Wish me luck for my report, everybody! Jeremy: Uhh, Ms Meyer! I’m sorry but…I need to go to the infirmary…I don’t feel too well, I feel, uh…I feel really sick! Ms Meyer: Oh, yes of course, Jeremy! Go head! Odd: Uh, I’ll take him there! I mean uh, you never know, huh? Jeremy: What if the last calculations I tried were the last ones? Yumi: It’s a living symbol of Japan, and it’s a…ah! Oh! A drape?! Odd: Let’s not go overboard! Odd: Wow, he’s really flipped his lid, huh? Jeremy: He’s after you, you have no choice, you absolutely have to hide! Taelia: As a pickup line that one’s a lot more original than the one your friend tried! Odd: Have you gone mad or what, Einstein? What if Aelita is still on Lyoko? Jeremy: Can you see anything? Odd: Boy oh boy, finding someone around here is going to be harder than finding an idea in Jim’s head! Aelita: Oh, you found me at last! What about the Guardian? Odd: You mean that big fat fire bubble? Ha, he won’t bother you anymore! Odd (to a Blok): You always pick the wrong time, huh? Jeremy: Well anyway…if you look closely, you can see their eyes aren’t the same! The nose is different, and so is the hair…they’re not similar at all! How could you have possibly thought that she was Aelita? Ulrich: Did you just say that we thought…? Jeremy: You’d have to be blind to think that!